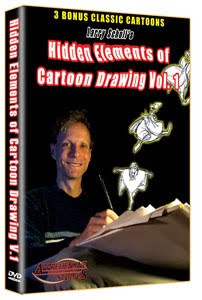 Apprehensive Films is running a sale on our Hidden Elements of Cartoon Drawing DVD hosted by Larry Scholl. Buy it now at http://www.thegrindhouse.net/ and use coupon code "newstore" to save 15% when checking out. Learn cartoon drawing techniques that are often overlooked in standard "How To Draw" books and videos. Follow along with Master Storyboard Artist Larry Scholl as he guides you through beginning, intermediate and advanced techniques. BONUS CARTOONS: This DVD includes three classic cartoons that were sources of inspiration to Larry Scholl when he was becoming a Storyboard Artist. Special Features: Three Classic Cartoons Felix The Cat: Bold King Cole, Popeye: Greek Mirthology, Superman: The Mechanical Monsters.